And as said, we now take the time machine back into the world of Nintendo, even when this flash game loads you’re staring at a Nintendo cartridge loading bar. 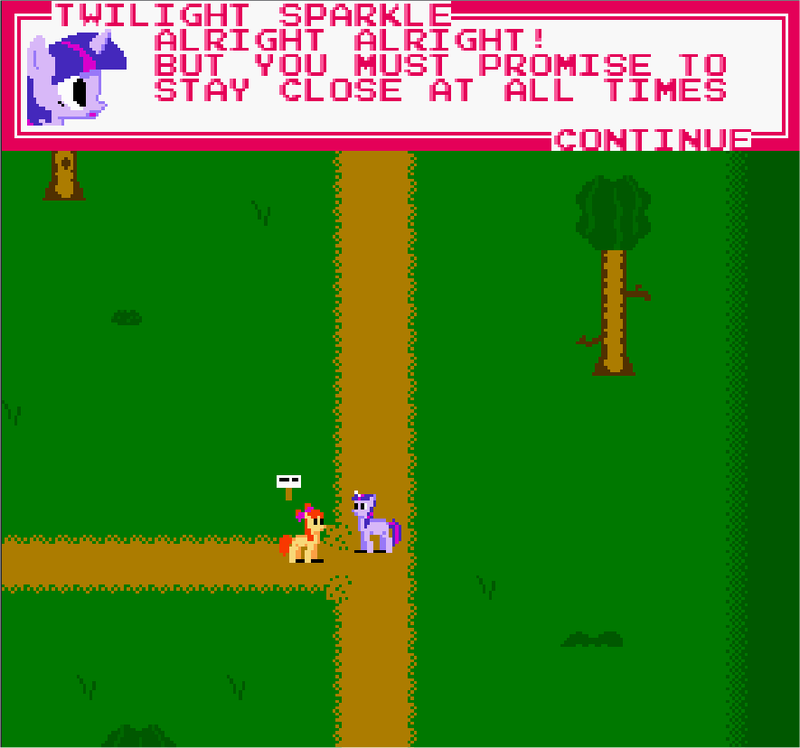 The Story of the Blanks is a 8bit style puzzle rpg style game in which you play the role of Applebloom, and her quest to find her cutie mark. The story starts with you bumping into Twilight, who is going to Zecora’s house in the Everfree Forest to deliver some books. You follow Twilight through the forest to Zecora’s house and make the delivery successfully. But Zecora warns of a storm that is coming, and on your way back you encounter a fallen tree. Twilight uses her magic to remove the tree, only to find a whole bunch more. When you grow bored of her removing the trees (or walk back where you came) is when you encounter what appears to be Derpy, who runs off into the forest. You make chase only to end up in Sunny Town, some hidden away village full of grown up ponies with no cutie marks. You end up chasing Derpy to her house and find the door is locked, and you’re stuck in this village. You’ll see what path you must take, or well your mini-quest to unlock the door. This is where I stopped as I couldn’t find anything, though I’m sure its there. Where’s my big guide book to help me?! Its worth a try, and let me know if the blonde/grey pony is Derpy, cause I”m not 100% sure of that. I thought it was derpy too, at first, but it isn't her. also, I beat it, here's a tip: Inspect everything that looks like it could contain something, and you CAN enter the first building. Not quite, it LOOKS like, but is another pony. Play the whole game, is a very good one. and 2: This is an entry for my creepy pasta game contest, which is why I haven't done ANYTHING with it yet. Would be awesome if this could be extended to … dunno … 45 minute of gameplay? ^-^"
Everything you need is in the lower part of the village. It took me a couple tries to figure that out. But that's only the start. I had to give up. I could not get past the third, way too damn fast shadow pony thing in the ruined town and having to start that area over every time got too annoying. It's too bad. I was interested in seeing how it ended. She meets the pony that looks like derpy who apologizes. She has a magnifying glass as a cutie mark and says she is good at finding things…. Then she finds a way for you out as the messed up dark ponies converge on you. You find twilight and goo back to the village. The last the the derpy-esque pony says is Goodbye, friend. As for beating it, there's a gem near the bottom left corner in one of the screens on sunny town. interact with it, go back to the pony who lost her friend's present and interact with her again. One she leaves the doorway… go inside. after getting past some blocks you can push there is a crank you will need to grab. Take that to the dark house and interact with the well. Once you see the first dark pony, avoid it. It won't follow. The second one will. Lure it towards the bottom left corner then dodge around it and push the block through. As soon as you are nearing the edge of the charred tree? Barricade? anyway, as it fades off into smaller pixels, make a break right. From there, just continue forward without stopping and avoid the dark ponies and you'll make it.